The Super-Chuffer has been around since 2014, and has proven to be quite popular. However, there are a couple of things that I've always wanted to do, so I thought it was a good time to revisit the design and see if I could do some tweaks. There were three things that I identified right off the bat that I'd like to change, and one unused feature that I decided to remove. Make the footprint smaller. Even at it's current small size, I have issues at times stuffing it into some upgrades. Fix the light sensing so it works with all versions of the R2LC as well as the earlier LCRU and LCRU2 packages. Monitor the smoke unit power to cut all power to the smoke fan if the smoke unit isn't energized. Remove the opto-isolated chuff output as the way this unit is used, that's never been useful. After a little time at the computer and workbench, enter the next version of the Super-Chuffer, the Super-Chuffer II. I'm happy to say, all the original design goals were able to be realized. The new version will be more than 30% smaller in footprint and about 15% thinner than the existing board. It now supports the additional features I mentioned, and you'll notice that HD2 has been removed as it's no longer needed. Well done John. Glad to see you didn't stop improving an already great thing. It will be the same price when it's in production. So far I have exactly one, and you see it. I will hand build a couple more and do some real testing in actual installations, but I don't expect any issues. Most of the design has stayed the same, but I did use some improved parts and small circuit changes. I'll also want to sell the current stock of the existing design before these will be shipping, I wouldn't want to eat all of those boards. Ok now that's it! I am taking my daughters polar Express to Hennings for Railsounds install with the supa chuffa II! That will make a nice Christmas display this year.. along with the ylb and the other Electronic Gizmo( outside rail activator) for the Christmas layout! its going to be nice that's it's smaller than the original one. Thanks for working on the improvements! I like the smaller size and switching the fan power off if there is no heater element load. I've got a couple of ERR sound commander installs planned and was going to use the optocoupler on the Super Chuffer (in my opinion, its simpler than gluing on the magnets and switch even though you've got another two wires in the tender tether). Any chance we could convince you to educate us on how to do an optocoupler for use in this application? Don't get too excited yet, I just have one prototype. It'll be months before I clear out the backlog of existing boards and produce this new one. I wanted to get the design ready and tested so it can be done in the next production run. It will be nice to be able to squeeze this into some smaller spaces, that was my original drive. I have had several installations recently where it was difficult to find room for the S-C. As small as it already is, it seems there's always room for improvement. Two thumbs up!!! Have installed the Super Chuffer into my older EM-1, along with Chuff Generator, ERR's -CCM, and modified the smoke unit ; 20 ohm resistor, 1/4 inch hole on top of the smoke unit board, hollowed out some diecast in the impellar chamber to the smoke chamber and let me tell you, I had Ben Fiorello asking if the engine was an MTH unit when he saw it at Greenberg's Train & Toy Show in Edison, N.J. Well worth the time, money, & effort in my opinion. Three cheers for the Gunrunner. Smoke, Smoke, Smoke!!! Thanks guys. I hope it lives up to the great expectations. Looks very interesting John. This really pours the smoke out compared to regular smoke units, right? I still got to get with Alex, do that in a week or two. Dave, the Super-Chuffer is the electronic control for the smoke chuffing and smoke at idle, as well as the lighting features it offers. Getting more smoke takes some tuning of the smoke unit. Normally, when I do an install, I do a tuneup of the smoke unit for maximum smoke with the Super-Chuffer installation. John, great work. Job well done. I need the smaller footprint. Will you be offering these soon? It'll probably be available sometime around the summer, as I had stated, I still have a bunch of the current design in stock that I need to sell before offering these. I also ran into an issue with my board assembly house, the US based one closed. I've gotten several jobs through some Chinese assembly houses with good results so far, so I may have cracked that code. It's possible to use this on a conventional locomotive, it takes an additional filter cap added to allow the power to drop lower and still maintain voltage to the board. I was very successful with a 2200uf 35V capacitor added in parallel to the filter caps on the board. The S-C was really designed for command operation, but was just because it was easier to provide power with smaller components when I could count on having steady track power. thanks for taking time to respond! pls remind me what I would need to order of the new err boards to upgrade a conventional Lionel diesel. Does cruise commander give me tmcc plus cruise and then I still need the sound board? Lmk thanks. Greg, the Cruise Commander does indeed give you the TMCC and cruise, that and the RailSounds Commander are the two boards you need for the full upgrade. Obviously, that diesel has to have DC can motors, if you have an AC model, you use the AC Commander. Thanks. How do I determine the type of motor the engine has? I know it’s sometimes on the box but I don’t have some of the post war boxes or is it as easy as the year built? Thx again. How about telling us the exact model, better yet post some pictures? It's usually pretty obvious which motor they have, the DC motors are very quiet, the AC motors growl as they run. The Super-Chuffer is dead, long live the new Super-Chuffer II! The production boards arrived and I programmed up a bunch of new processors, all is well! The first production items will be at Henning's Trains today. Did any post war trains come with a DC Can motor? Without knowing what you have we can't help. I suggest you start a thread about your topic, this isn't the place for it. Nice! I waited a while for these boards to arrive. Is the enhancement to cut all power to the smoke fan if the smoke unit isn't energized a feature of the PIC chip programming, or is it tied into the hardware of the new board? ...And is the wiring the same ( I don't see the instructions/tech info on Hennings site, as is provided for the original). Thanks again for getting these done for us. A quick question. I have the Lionmaster Class A TMCC 6-38049. I am going to upgrade the cruise with ERR hopefully later this year. Also would like to upgrade the smoke to synchronize. Will this fit in that semi-scale locomotive? If so, do I need to buy anything else to make it work? Both. I needed an extra uP pin to control it, and I had to add a opto isolator to sense the smoke heater voltage and let me know that the smoke was active/inactive. There is a one-wire difference, the two +5V outputs are now one, the other one is the smoke heater voltage in. Also, the H2 header is gone, that was a feature that sounded good when I originally designed it, but in practical applications, isn't really needed. Yep, it should fit. The whole point of the redesign was to make it smaller and easier to fit into smaller locomotives. 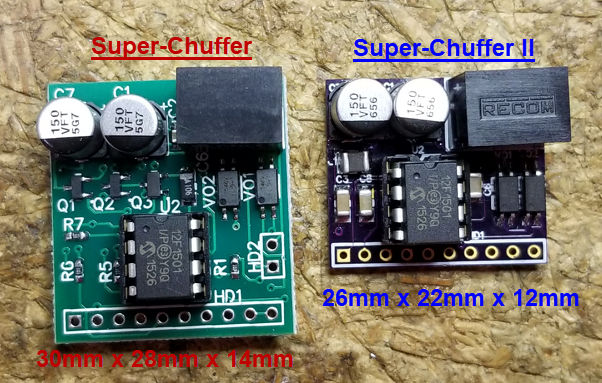 If you also want 4-chuffs/rev for the upgrade, you'll also want to consider the Chuff-Generator. I've put the older Super-Chuffer into a couple of Lionmaster locomotives, so no reason this wouldn't fit in that one. Love it, few of my engines are going to get this little board. And I have the boards waiting patiently for you! Will you be attending the upcoming LCCA Meet in Chicago, end of July? You're on the list Larry. I won't be at LCCA, but I'll be at York in the fall. That’s great, thank you and hopefully I can get to York in October, however, if not, we can get together by email. Although I am retired, it still seems there’s not enough time to do everything I want to do. Like everyone else that’s worked most of their lives, home projects that were on the back burner, suddenly became very important.....it’s all good.